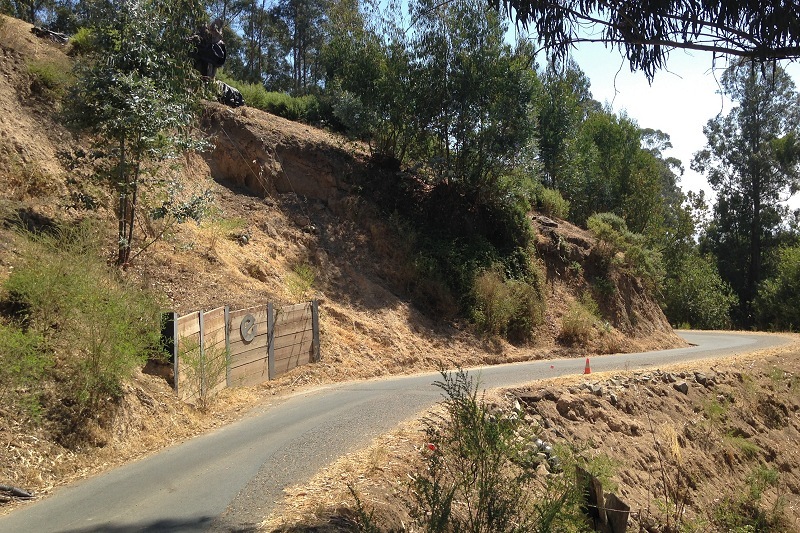 Ten years ago, I took my first walk on the fire road above the North Oakland Regional Sports Center (Caldecott Field), where I saw fit to document an incipient landslide there. 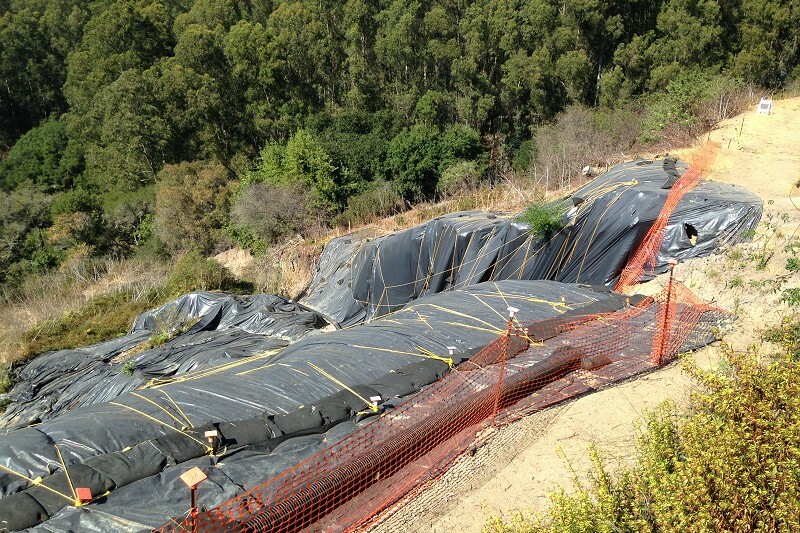 In June, standing on Skyline Boulevard, I noticed that the site was shrouded in black plastic, a surefire sign of a landslide. Passing by again last week, I noticed a change and made the time to visit. 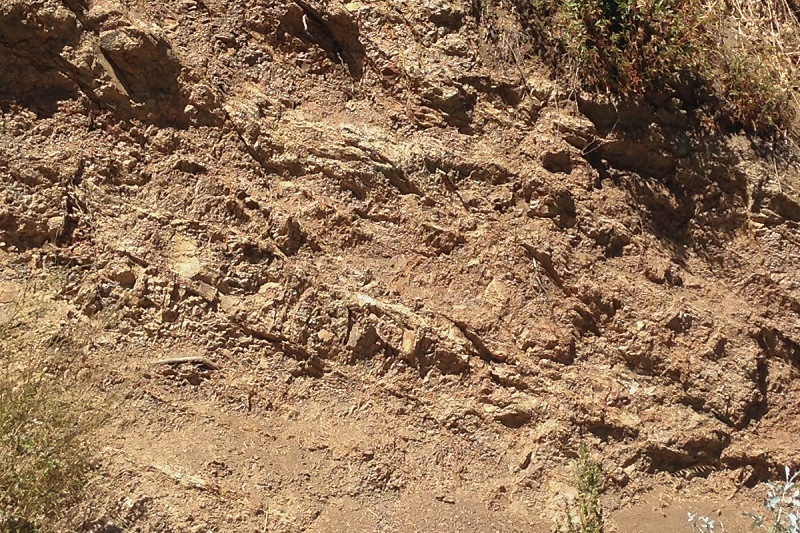 The change was that the center of the previous landslide had given way in a new landslide. This new slide looks ugly, and of course the fire road will need fixing, but the slide material didn’t seem to go far downhill. The picture seemed pretty simple to me, standing there, but then I came home and looked at the area, in Google Maps 3D, featuring imagery as of a couple years ago. The view is to the south. Two things to see here. 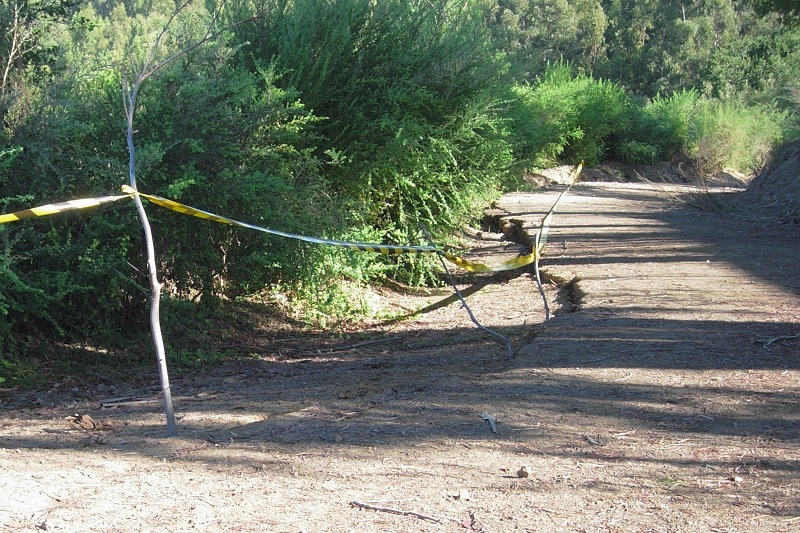 First, the fire road was resurfaced at the place where I shot the 2008 photo (just below the water tank). 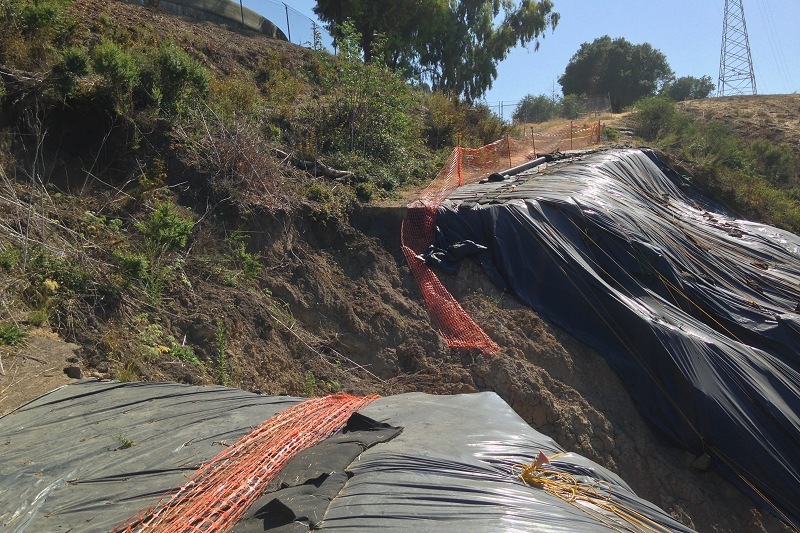 So the slide shrouded in plastic was likely the second one since 2008. 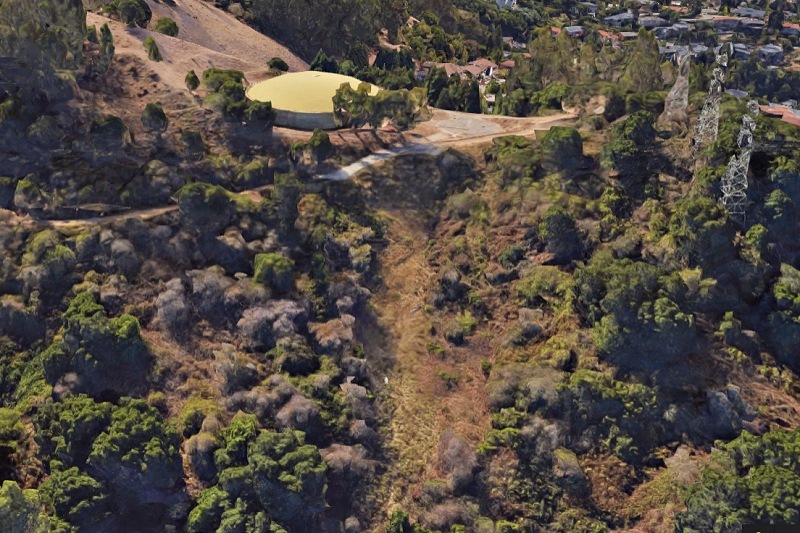 Second, the hillside below the slide is stripped of trees — that is, it’s a landslide chute. Maybe the slide I shot in 2008 did that. Air photos from 1968 and 1939 show nothing distinctive at that location. If only I’d been paying attention here over the last 10 years! But Oakland’s a big town with a lot to keep track of. A closeup of another roadcut shows wavy lines caused by shear within the rock. The Sobrante was a big headache to the people excavating the Caldecott Tunnel bores. It caved in on the men digging the first bores, and the fourth bore required heroic engineering to keep it all shored up so the concrete could be poured. Likewise, houses built on this rock need strong foundations and designs that are sensitive to the site. This entry was posted on 20 August 2018 at 8:03 am and is filed under Landslides. You can follow any responses to this entry through the RSS 2.0 feed. You can skip to the end and leave a response. Pinging is currently not allowed. Andrew- very interesting! Great post.